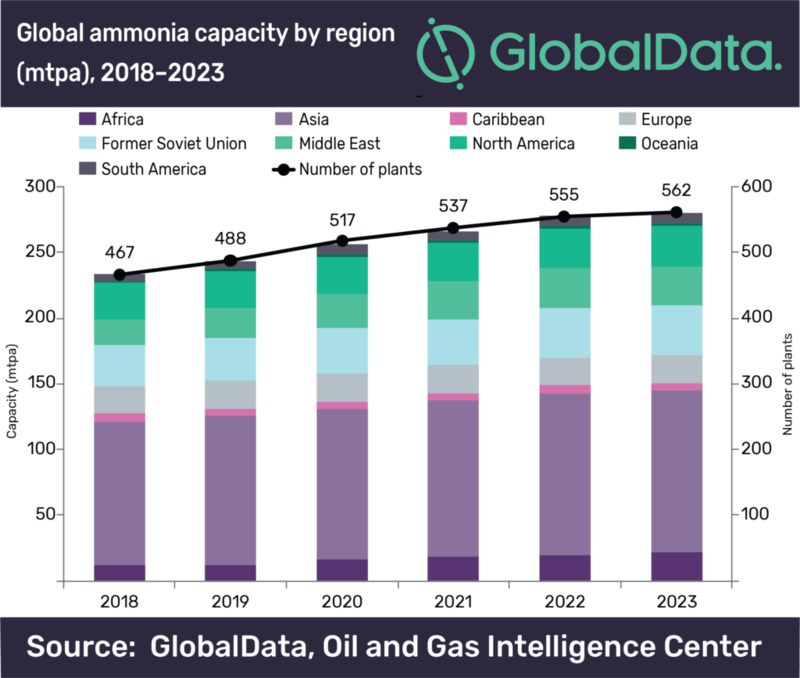 Global ammonia capacity is poised to see considerable growth over the next five years, potentially increasing from 233.85 million tonnes per annum (mtpa) in 2018 to 280.36 mtpa in 2023, registering a total growth of 20%, says GlobalData, a leading data and analytics company. GlobalData identifies the Former Soviet Union (FSU), as the second highest in terms of ammonia capacity contribution in the global ammonia industry. It is expected to increase from 30.82 mtpa in 2018 to 37.65 mtpa in 2023, at an AAGR of 4.0%. Most ammonia capacity contributions are in Russia, with capacity of around 24.59 mtpa. Major capacity contribution will be from the plant, Novomoskovsk Azot Novomoskovsk Ammonia Plant, with a capacity of 1.84 mtpa by 2023. Within the Middle East, ammonia capacity is expected to increase from 20.12 mtpa in 2018 to 30.05 mtpa in 2023, at an AAGR of 8.0%. Among countries, Iran’s capacity will reach 13.12 mtpa by 2023. Major capacity contribution will be from the plant, FALAT RCF GSFC JV Chabahar Ammonia Plant, with a capacity of 1.05 mtpa by 2023. Ammonia capacity in North America is expected to increase from 27.23 mtpa in 2018 to 31.16 mtpa in 2023, at an AAGR of 2.7%. The US is forecast to be the top country in the region with capacity additions of 22.64 mtpa by 2023. Major capacity contributions will be from the plant, Nutrien Kenai Ammonia Plant, with a capacity of 1.25 mtpa. Europe follows among the global regions in terms of ammonia capacity contributions and it is expected to remain at 21.23 mtpa from 2018 to 2023. Germany leads in Europe, contributing around 3.48 mtpa by 2023.